Review Fedora might not be getting a complete makeover or flashy new features in version 10, out today, but some welcome enhancements under-the-hood make this a worthwhile upgrade. If you've never given Fedora a try, now is a great time. The tenth revision slick and stable and it has a rock solid feel to it that, for our money, trumps even Ubuntu's latest release. Fedora 10 has many of the features we loved in Ubuntu - the latest version of GNOME and the new NetworkManager utility, for instance. As a bonus you also get the always excellent RPM package system, the new Empathy instant messenger framework, PackageKit and host of other Fedora-specific tools. For long-time Fedora fans, two noteworthy changes in this releaseshould be welcome news. The first is the new "glitch-free" version of PulseAudio, the underlying audio system in Fedora. So what is this glitch-free version of PulseAudio? The details are quite complex, but essentially what you'll notice is better, smoother sound output. PulseAudio itself is not new and offers a number of advantages over other audio subsystems. Unfortunately, the version that shipped with Fedora 9, which we a reviewed earlier this year, had some performance and reliability issues. The new version is designed to solve those problems and also improves PulseAudio's integration with other system tools and applications. The glitch-free part refers to the timer-based scheduling system that, according to its creators, minimizes latency problems, reduces dropped audio, and also uses a bit less power to run. The most obvious thing you'll notice in version 10 is how much faster and smoother Fedora boots than before. This is thanks to several things, notably the new Plymouth graphical boot tool (which replaces the old Red Hat graphical boot - RHGB) and the new flicker-free X server. The absence of a flicker between when the boot screen exists and X loads is the result of Fedora's decision to move X from virtual terminal seven to virtual terminal one. It sounds like a small, unimportant change, but the results are worth it our opinion. There are those, however, that think the performance gain isn't worth deviating from how the rest of the Linux world does things. But so far as we can tell there aren't any major consequences to doing things differently and the results - faster boots and very solid feel for Fedora 10 - seem worth it. Most Linux users we know tend to customize their desktops to suit their whims, but those that don't will notice the Fedora has a very nice new Echo icon theme (in the GNOME version of Fedora anyway). Echo works well with Fedora's overall default look - minimalist and, dare we say, classy. Of course if you're a custom theme fan the new icons probably won't be around for long. As for our experience with Fedora 10, we tested the first release candidate and found it remarkably stable and solid, which boded well for the final product. We opted to use a live CD install and the process was perhaps slightly longer than Ubuntu's, but certainly every bit as easy. 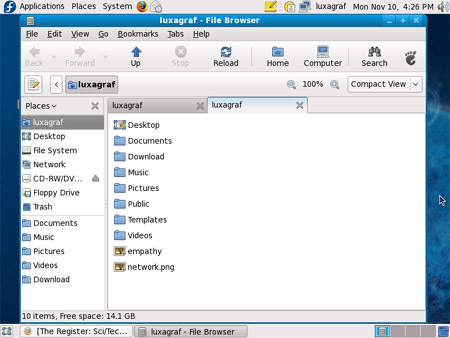 Even Linux newcomers should have any trouble getting Fedora 10 installed and running. Once installed, we booted into GNOME where, as always, Fedora opts for a more minimal package collection than most other distros. We prefer it this way since a fresh Ubuntu install generally requires about 20 minutes of package deleting before we feel at home. With Fedora's approach you can simply head to the RPMs and install what you'd like.